Celox is for arresting life threatening bleeding. 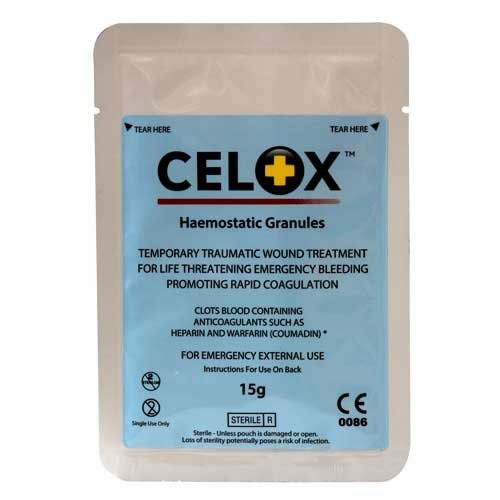 High Peak First Aid is an official stockist for Celox products: we have Celox 15g and 35g plus Celox gauze and the Celox applicator in stock. A summary of Celox is added to the High Peak Wilderness First Aid 16hr course to give participants the knowledge to decide if they need to attend further training. Free training is available and held several times a month if you have attended a course with us. The Celox training is also part of some of the courses provided at High Peak First Aid Training. The Celox training is taught in addition to the use of tourniquets. The Health and Safety Executive has issued a statement on the use of haemostats. Further details are found in the HSE June 2016 First Aid e Bulletin. The HSE makes reference to types of workplace that may benefit from having employees trained in the use of tourniquets. These sectors include and are not limited to forestry, agriculture and construction.